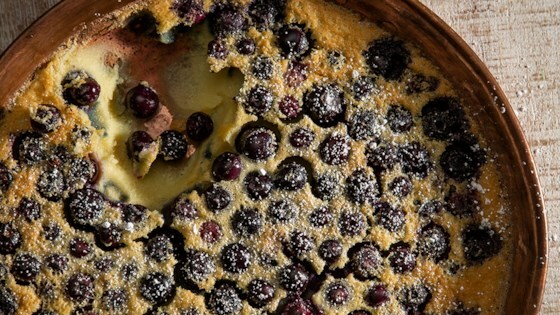 "This sweet, eggy oven pancake is bursting with juicy blueberries. Dust with powdered sugar just before serving." Preheat oven to 350 degrees F and butter a 9-inch oven-safe skillet or baking dish. Puree all ingredients except blueberries and powdered sugar in a blender until smooth. Pour into skillet and top with blueberries. Bake for 40 minutes or until center is set and top is lightly browned. Serve warm, dusted with powdered sugar. See how to make a super quick-and-easy fruit dessert.